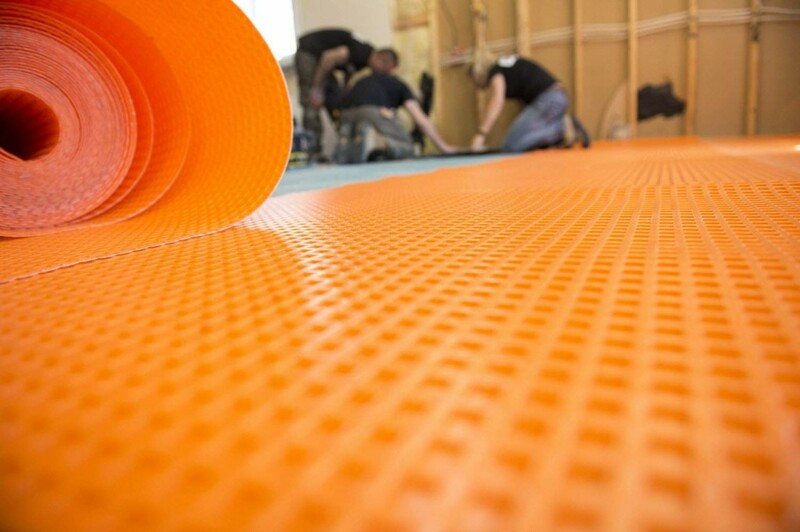 One of the most important structures of any home or commercial building is the flooring system. After all, it’s the flooring system that is responsible for carrying the weight of the walls, roof, furniture and people. That’s a big responsibility! Just how much weight your floor will be able to carry is completely determinant on how well your floor structure has been designed. Improperly installed subfloors, or using the wrong material, can cause structural failures, excessive movement, sagging and squeaking. Keep reading to learn about the 4 most common types of subfloors and the characteristics that determine quality and long-term performance implications. Plywood is probably the most common subfloor out there, and in fact, until the 1980s, was just about the only subfloor used in single family homes. Plywood is made by layering fabricated sheets of wood veneer and then bonding them together with special adhesives under heat and pressure. Because these layers are cross-laminated and layered, plywood is incredibly strong and not susceptible to the expansion and contraction that hardwood is. Plywood typically comes in interlocking sheets that measure 4-foot by 8-foot and are either 5/8 or ¾ inches thick. Because these sheets have a tongue and groove that interlock, plywood makes an incredibly secure base for just about any flooring, including hardwood, laminates and bamboo. If you are installing new floors and subfloors and choose to go with plywood, remember to apply subfloor adhesive to the top of the floor joists. This will prevent the plywood from moving around and squeaking. Oriented strand board got its name because it is created by taking strands of 3- to 4-inch wood and layering them in a crossing pattern. They are then glued and pressed creating a board that is denser and absorbs less water than plywood. Like plywood, installing OSB required the boards to be glued or nailed to the floor joists. Generally speaking, ¾-inch thick bamboo (solid) floors would be installed right over top of ¾-inch thick OSB subfloor, and the planks at a 90 degree angle across the floor joists. This pattern will stabilize and strengthen the whole flooring system. When installing engineered, solid or floating that’s less than ½-inch thick, we recommend you add an additional 3/8-inch or ½-inch thick plywood underpayment. This addition, when glued or screwed onto your OSB subfloor, will add stability. You may think pouring a concrete subfloor will solve all your moisture problems, but concrete is susceptible as well. Concrete slabs, which are typically 4 to 6 inch thick and 3,500 – 5,500 –pound per square inch (psi) are created using water, and they can take months to fully dry out. Because of this you will absolutely need to test your slabs before installing your finished floors. An easy way to do this is to tape a few sheets of plastic down on several areas of your slabs and wait a few days. If moisture develops under the plastic, your slabs aren’t dry and your bamboo floors should NOT be installed. To minimize water transfer from natural outdoor water levels, install plastic before pouring your slabs. High performance panels are becoming more common in building. These panels are engineered and offer many of the same benefits of plywood and OSB but with some distinct advantages. These boards are built specifically to be moisture-resistant and have been manufactured with special resins integrated right into the panels. This significantly reduces water absorption and reduces swelling that is common to plywood and OSB subflooring. These engineered panels not only minimize swelling due to moisture, but also cupping, warping and delaminating. This eliminates any need for sanding or costly replacements. In addition to standing up to moisture, high performance panels are also more durable than traditional plywood or OSB underlayment. Thanks to added density and resin technology, the panels are stiffer and stronger and are able to hold nails better. Panels come in 19/32-inch, 23/32-inch, 7/8-inch, 1-inch, and 1 1/8-inch thicknesses, and install and remain flat. Oftentimes when building a home, the subfloor gets installed before the roof does. This means the subfloor is going to be exposed to the elements and inevitably get wet from snow or rain. Both OSB and plywood will absorb water and this can lead to the subfloors swelling and requiring either sanding or total replacement before the finish floor can be installed on top. There are differing opinions on which material stands up better to moisture. Many builders consider OSB to be more structurally sound than plywood, and many others say that OSB edges, particularly edges that have been cut, will swell when exposed to significant amounts of water. Others say that when plywood takes on moisture it expands evenly throughout the panel, dries quicker, and shrinks to its original size quicker than OSB. Assuming you will be installing your bamboo floors over either plywood or OSB, the two most common and affordable subflooring materials, you’ll want to set your moisture meter accordingly and measure by taking at least 20 readings per 1,000 square feet. Compare that level to that of your new bamboo planks and follow manufacturer’s guidelines for acceptable percentage difference between the two. Should you find areas of your subfloor where moisture may be a concern, consider installing a vapor retarder over your subfloor to minimize moisture transfer and the impact of seasonal humidity fluctuations. Once you know your moisture levels will not be an issue you’ll want to check to make sure the subfloor is stable. Check to make sure fasteners are not over or under driven, and fill or sand any uneven joints. Once your subfloors are properly installed, dry, and stable, you’ll be ready to start laying your new beautiful bamboo planks. ‹ What Are The Best Floors For Dogs?